In 1986, my latest, greatest quilt was Lady Liberty Medallion. I was thirty-seven years old, living on a farm in Madison County, Iowa, my children age ten, six, and three, many of my youthful dreams still intact. I didn’t know I would be divorced within two years, that from then on I’d be the head-of-household (and breadwinner), or that my fledgling quilting career would be the remarkable journey it became. My dream-of-the-moment was to win the Great American Quilt Contest, sponsored by 3M and the American Folk Art Museum, and take home the $20,000 purchase prize. My entry was traditional—a medallion with the face of the statue at center, commemorative lettering, symbolic patchwork blocks, and an undulating outer vine. I used hand appliqué and reverse appliqué, machine patchwork, and hand quilting, my quilt exactly 60″ x 60″ as specified by the contest set to honor the Statue of Liberty’s 100th birthday. When I was chosen as Iowa winner, my dream gained traction, and Lady Liberty went to New York for judging. The California quilt, a non-traditional, painterly piece, Glorious Lady Freedom by Moneca Calvert, beat us all, but I got to go to New York City for the first time, made friends with amazing quilters like New York winner Paula Nadelstern, and returned to Iowa to continue sewing while my quilt toured for three years. Had I won, my quilt would be part of the Museum of American Folk Art’s permanent collection, an honor to be sure, but the $20,000 would be long gone. Instead, Lady Liberty still belongs to me. I unfolded her recently, her eyes reminding me of my own steady gaze at thirty-six, my heart flooding with nostalgia as I considered all that has happened—to me and to the meaning of freedom, for women in particular—in the intervening three decades. A couple of years ago I made a much smaller Lady Liberty, partly to prove I could still do needle-turn appliqué and partly to support Quilts of Valor Foundation. Recently, I carried the original Lady Liberty Medallion with me to our cottage on Washington Island to launder it for the first time and let the breeze off Lake Michigan to do the drying. Her colors may have faded, but her strength remains. That’s a beautiful story…almost as beautiful as the quilt itself. 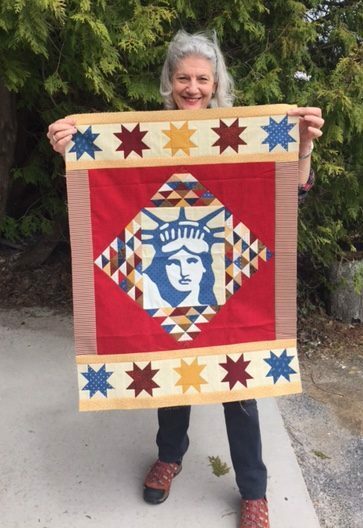 It was such a thrill to see the Lady Liberty quilt at the retreat in September. It is beautiful and an inspiration to everyone. Thank you, Ann, and thanks also for your recent, lovely letter. So glad you made it to Lincoln and Hamilton.